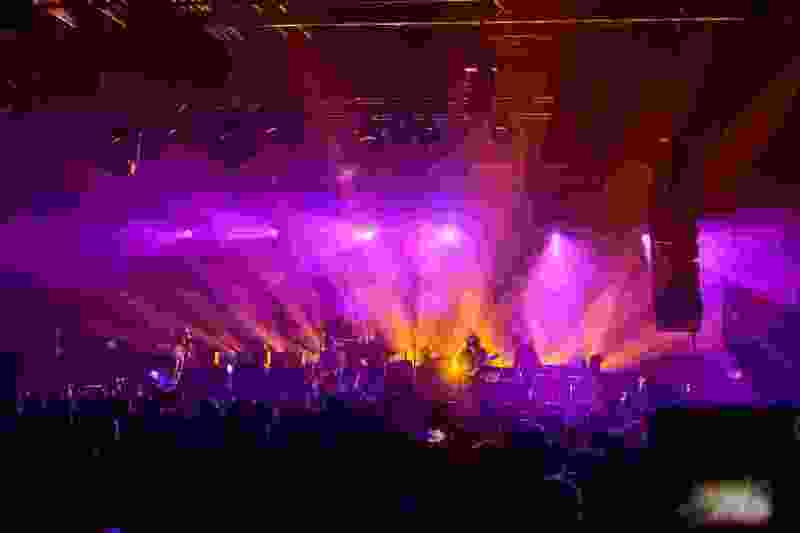 (Trent Nelson | The Salt Lake Tribune) My Morning Jacket performs at The Complex in Salt Lake City in 2015. The operators of one of Salt Lake City’s busier concert venues, The Complex, are being charged by federal prosecutors with building and running the business using more than $1 million earned selling marijuana. The accusation is part of a 13-count indictment announced Monday against three people — Gabriel Seth Elstein, 33, of Park City; his wife, Angela Christina Elstein, 32, of Park City; and Seth Dale Gordon, 48, of St. George — that alleges they conspired to transport hundreds of pounds of marijuana from California to Utah and then across the country. Dumbles Holdings LLC, a company managed by the Elsteins, is also named in the indictment. Prosecutors allege that the Elsteins and Gordon ran a drug-trafficking operation from April 2007 through December 2013, buying and moving at least 2,500 pounds of marijuana and laundering at least $5 million through Bondad Productions, a company that promoted electronic-music shows, and The Complex, a music venue on the west side of downtown Salt Lake City. The three were arraigned in federal court Friday, according to a news release from John Huber, U.S. attorney for Utah. Gordon and the Elsteins have been released pending trial, which has been set for Dec. 14. A publicist for The Complex did not respond to a request for comment Monday. An attorney for Gabriel Elstein had no comment Monday; attorneys for the other two could not be reached for comment Monday afternoon. The charges include possession with intent to distribute a controlled substance and money laundering. The indictment describes a scheme that ran from 2006 to 2014, in which Gordon and Gabriel Elstein would find marijuana suppliers in California, and hire drivers to take the marijuana to Salt Lake City and locations in Minnesota, Illinois and Wisconsin for packaging and distribution. At various times, marijuana was stored or packaged at a home in the Avenues, a warehouse and an auto shop in Salt Lake City, and a garage and an orchid ranch in Chico, Calif., the indictment said. The drivers would bring money back to Salt Lake City and take it to California suppliers to buy more pot. In one instance, the indictment states, $1 million in cash was vacuum-sealed in the shape of the Empire State Building for delivery to a California supplier. Along the way, Gordon and the Elsteins employed four different suppliers and six drivers, according to the documents. According to the indictment, Gordon and the Elsteins began construction on The Complex in 2009, at a cost of $1.3 million. They started with $400,000 in marijuana proceeds laundered through Bondad; the remaining $900,000, also in marijuana cash, was paid directly to companies and individuals involved in the construction, it alleges. The indictment alleges that Gordon made cash payments, in installments of $50,000 in shrink-wrapped plastic bags, nearly every week to the project’s construction foreman, identified in documents as I.M. The indictment also said Gordon used marijuana money to pay expenses for music shows. During the course of the scheme, prosecutors allege, Bondad and The Complex kept two sets of books to launder the marijuana money. One set contained actual ticket sales and expenses for a concert; the other inflated sales of tickets, merchandise and concessions, while deflating the expenses. At first, Gordon kept the books, but in 2009 he taught Angela Elstein how to do it, according to the indictment. All three face sentences of 10 years-to-life on the conspiracy to distribute count. Prosecutors also seek forfeiture of The Complex, at 536 W. 100 South, two properties in Park City, and a $70,000 diamond Gabriel Elstein bought for Angela Elstein. The Complex will remain open, Huber’s release said.